The recently filed Senate Bill 294, deceptively titled the "Dignity for the Unemployed Act" would require any individual trying to receive unemployment benefits to first volunteer for 24 hours/week before being eligible to receive the benefits. This Act would inhibit our community members from searching for employment and highlights how out of touch some Georgia Dome politicians are with the realities facing our community: 11% unemployment in the city of Atlanta, the largest wealth gap between rich and poor for all cities over 100,000, threatened closure of post offices and thousands of middle class public sector jobs. We need Jobs Not Cuts. Atlanta Jobs with Justice along with a strong contingent of allies including members of ABLE (Atlantans Building Leadership for Empowerment), Occupy Atlanta, Interfaith Worker Justice, Southern Christian Leadership Conference (SCLC), Heroic Veterans of Georgia and more performed a delegation to Governor Deal's office to demand good jobs in our community and for policies that support community members that can't find jobs. (see 11% unemployment). We then heard stories from Balewa Alimayu about the barriers that veterans face to finding employment. We heard from George Kimbro Johnson about the power in having meaningful employment and health insurance, especially for disabled community members. We were then led by Jane DeJournette and La'Marcus Cook in lifting up our thoughts and prayers for good jobs and justice within our communities. We lifted up the thoughts and prayers of the needed change in our communities and the organizing and coalition building that must happen to make it so. 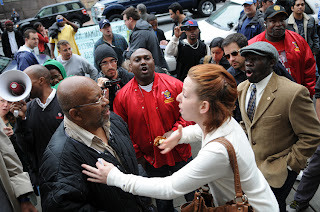 MEDIA ALERT: Unemployed Workers and Our Economy Need Help Now! Responding to new federal statistics for November, unemployed Atlantans and Jobs with Justice spokespeople will call for aggressive action to turn our economy around through a public hiring program and extending unemployment insurance benefits. Deceptively named legislation pre-filed by Senators John Albers and Chip Rogers called Dignity for the Unemployed would in-fact stigmatize the unemployed by singling them out for an unpaid community service requirement. Georgia's unemployment rate of 10.2 in October was higher than the national average (9 percent) for the 51st month in a row. Atlanta's October unemployment rate was even higher than Georgia's: 11 percent in the city, although it dropped to 9.9 in the greater metro area (Georgia Dept. of Labor). Georgia Labor Commissioner Mark Butler proposes lowering the maximum unemployment insurance benefit from $330 to 300 per week and possibly reducing the number of benefit weeks, to make up for a shortfall caused by the Georgia legislature giving employers a tax holiday. The United States Postal Service is under pressure to shut down needed community post offices in Atlanta and cut hundreds of thousands of public sector jobs, disproportionately impacting communities of color. 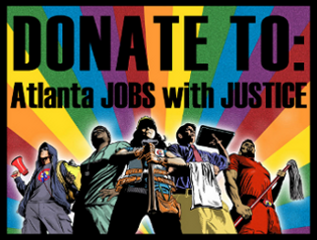 Atlanta Jobs with Justice demands an aggressive, large-scale public program to create good jobs, especially for the hardest hit populations: communities of color, youth, older workers, and the long-term unemployed, paid for by taxes on the most affluent individuals and corporations, and extension ­ not reduction ­ of unemployment benefits. Unlike budget cuts and layoffs, this would stimulate our economy, preserve vital public services and help families remain independent.